Chances are, your employees with children are saving for higher education, or trying to. There are lots of different ways to save from standard savings accounts to mutual funds. Saving for college is already hard enough, so you want your employees to make the most of every dollar they set aside. With ScholarShare 529 your employees can benefit from 100% tax-free growth when the money is used for higher education expenses—and that can mean a lot more money to help pay for college. As much as 20-50% versus 5.64%? That’s a big difference! It’s not about choosing the “right” investment; it’s about choosing the investment that’s right for them. One popular option is the Age-Based Portfolio. It automatically shifts from aggressive-to-conservative investments as their child ages. It maximizes the opportunities of their investment horizon. And there is no need for them to manually rebalance their portfolio each year. If you are helping your employees save for college, you want to make sure the options you are providing are an exceptional value in order to make the most of their savings. Use the funds across the country or overseas at many types of institutions from universities to trade schools. What’s more, anyone can contribute (not just parents – aunts, uncles, grandparents even family friends). 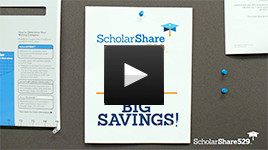 With ScholarShare you can easily open an account in just 15 minutes and easily manage it online or by mail. By setting up automatic contributions from your bank account or by payroll deduction (if supported by your employer), making regular contributions is hassle free. Considered an accelerated 5-year gift. One-year investment is treated the same as a 5-year period, free of federal gift tax, so long as no other contributions are made to the same beneficiary in that 5-year period. *Contributions are generally considered completed gifts for federal transfer tax purposes and are, therefore, potentially subject to federal gift tax. Generally, if a contributor’s contributions to Accounts for a Designated Beneficiary, together with all other gifts by the contributor to the Designated Beneficiary, do not exceed the “annual exclusion” amount of $15,000 per year (or $30,000 for a married couple), no federal gift tax will be imposed on the contributor for gifts to the Designated Beneficiary during that year.